As night falls earlier and the evenings get chillier, we’re turning our attention to winter interior design. Fireplaces are arguably as much pieces of art as functional heating appliances in modern homes. They can blend in harmoniously or become an attractive statement piece in any space, but they are always a key element of a home’s decor. Below, we’ve selected some of our favourite fireplace designs. 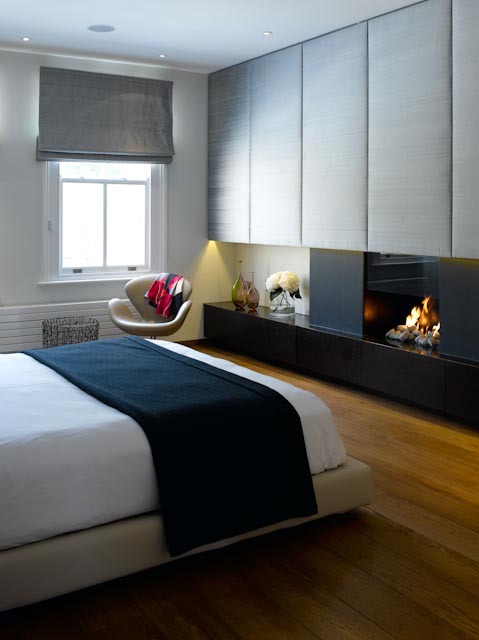 Our team of interior architects worked their magic on a Knightsbridge penthouse close to Harrods in London. The once bland and uninspiring flat was transformed into a sophisticated urban dwelling with a large new contemporary fireplace as a focal point for the living room. Set back into dark brown wooden wall panels, the narrow and horizontal fireplace gives the space focus and edge. The rectangular black fireplace is just below knee height and around a metre long, adding a unique aesthetic to the room. We installed a similar ultra-modern fireplace in our Chiswick house design. 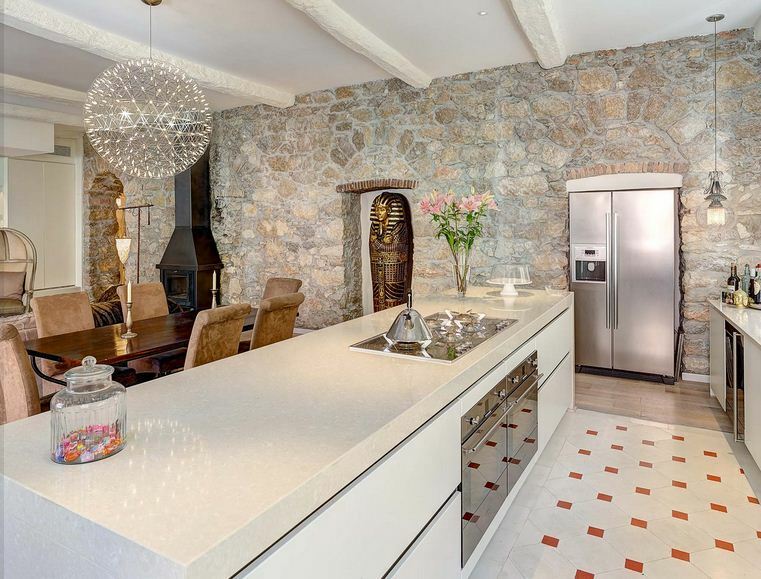 The owners wanted a modern but casual feel that would not date too quickly. They achieved this by creating small black “fire pits” in both the master bedroom and the living room that use lava stones rather than wood. A low, horizontal fireplace design is a perfect complement to the existing room designs, providing balance and subtle visual appeal. Callender Howorth’s collaboration with architect Sir Norman Foster was one of our most memorable. The Swiss ski chalet project took place in the high-end ski resort of Villars, which is famous for its excellent skiing conditions and beautiful wooded village. Chalet Solais blends classic sophistication with cutting edge technology and this is exemplified in the large feature fireplace. We centred the living area on a large charcoal coloured feature fireplace. The fireplace was designed with a glazed panel so that it looks onto the terrace and can be enjoyed from outside. It means that the beautiful mountain scenery can be glimpsed from inside and the fire can be seen from the village. Wood burning stoves are cleaner and more efficient than open fireplaces and bring the comfort of a real fire into your home even when you have a limited amount of space. Log burners are diverse enough for any home and they can come in more colours than traditional black as used in our Nice Apartment. They can add a lot of character to a living room, from square-shaped and rustic to modern white ones that add a ‘Scandinavian-chic’ appeal suited to light and large interior spaces. The interior designers working on our Essex Mansion project kept the concept of a traditional log burner that had already been in the property but completely updated it. The project involved gutting the house back to its 1980’s brick foundations and creating a blank canvas to fulfil our client’s brief. The brief was to design a laid-back family home that was also perfect for entertaining guests in the evenings, and the log burner really adds to this ambience. We changed the dated pastel pink wood burner for a sleek stainless steel one that had a much more imposing presence, so that it could become a focal point in the room. The pile of logs underneath it offers an eye-catching contrast between the two materials, which generate the warmth of the wood and the cold sheen of the metal. 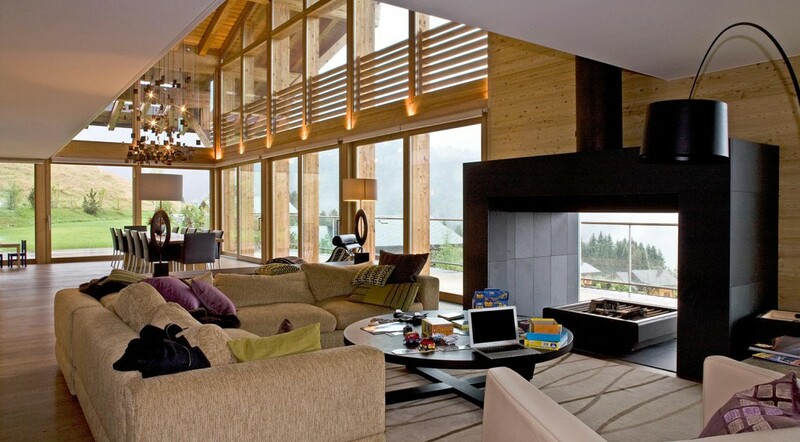 The wood burner is surrounded by large panoramic windows that look out into nature. If you would like Callender Howorth to source the perfect fireplace for your home, please contact us.